Using ray-tracing and global illumination that scales across all cores. We've tested a number of platforms from each performance group. The Intel Core i9-7980XE is the obvious many-core competitor while the Core i7-8700K is the mainstream champ. 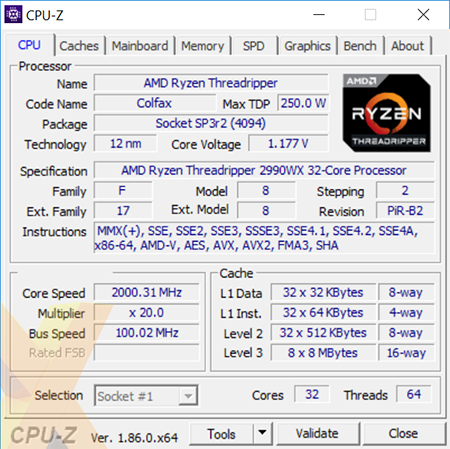 We've also got Threadripper 1950X, ostensibly to show the performance uplift from the best of the previous TR generation and, going mainstream again, the Ryzen 7 2700X. The graphics card has been upgraded to a GeForce GTX 1080 Ti FE and we've also kept to the maximum supported memory frequency on each platform. You'll note that we have added a number of professional apps in the CPU tests to better reflect how the Threadripper 2990WX is most likely to be implemented.